As white settlement and the resulting industrialization spread, so did the tailings wars. Skirmishes broke out repeatedly along Silver Bow Creek in Montana as well as on the Roaring Fork, Arkansas, Animas, and San Miguel rivers in Colorado. The reaction was always the same: The miners admitted they were wrecking the rivers, but they insisted that controlling their waste would cost too much and put them out of business and “kill the goose that laid the golden egg,” as one mining town newspaper put it. So, they kept polluting. Now, the oil and gas industry and its allies in Washington, D.C., are echoing the miners of old as they try to do away with the Interior Department’s Methane and Waste Prevention Rule, which was finalized in November of last year. The industry’s arguments today are just as flawed as the miners’ were a century ago. 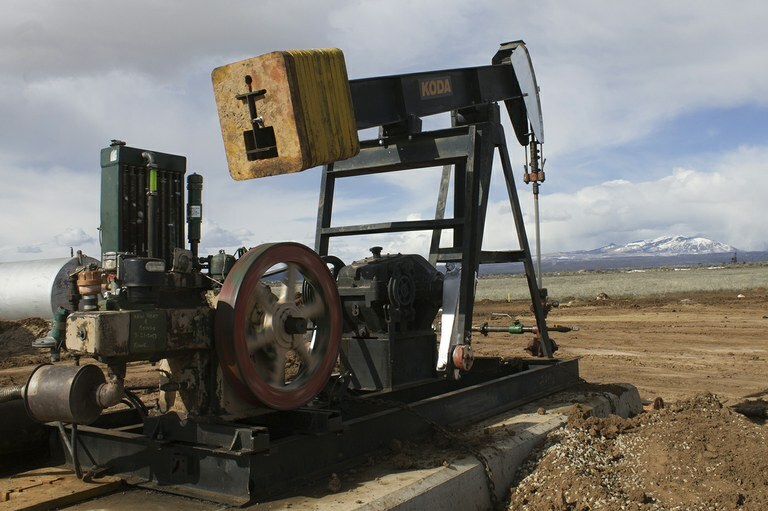 An oil well in southwestern Colorado. Just as it was standard practice for mills to dump tailings directly into streams, so is it common for oil drillers to dump natural gas, a mix of methane and other hydrocarbons, into the atmosphere. The practice is known as venting or, when the methane is burnt off, flaring, and it’s done when a well lacks a “gathering system” to pipe the natural gas that accompanies oil from the well to the market. Meanwhile, methane can leak from nearly every step of oil and natural gas production, from drilling, to fracking, to piping, to processing. In 2015, the oil and gas industry reported that its facilities in the U.S. collectively emitted 3.3 million metric tons of methane, with a little less than half that coming from facilities on federally managed lands. Methane is a potent greenhouse gas, with at least 86 times the warming potential of carbon dioxide over the short term. If methane is leaking, then so are harmful hydrocarbons, such as benzene, a known carcinogen. Those reasons are enough to get a handle on leaks and venting. But even for those who don’t believe in human-induced climate change — i.e. members of the new administration in Washington and many Republican congressmen — there is another compelling case for reducing methane leaks. The stuff leaking from the pipes and being vented and flared is natural gas, a marketable commodity. That’s money oozing into the air. More than $300 million worth of gas is lost annually from federal and tribal lands alone, according to a 2015 Environmental Defense Fund analysis. That adds up to millions in lost royalties for the feds and local communities, too. Reducing waste — which is clearly within the department’s mandate — is the main purpose of the Department of Interior rules, which impact some 100,000 onshore oil and gas wells. Reducing pollution by an estimated 566,000 tons of methane and organic volatile compounds each year is a favorable byproduct. The rules push companies to cut down on, but not eliminate, flaring and venting; require companies to look for leaks and fix them; mandate replacing high-bleed pneumatic valves with low-bleed ones and so on. The rules are hardly the “keep it in the ground” sort. Rather, they are the type of measures that a sensible company would take on its own. Nevertheless, industry advocacy groups claim that the cost of compliance, as high as $50,000 per well, would shut down thousands of oil and gas wells across the country. And as a result, destroy the communities that depend on the jobs, the royalties, and the taxes from production. This doesn’t compute. First, productive wells bring in millions of dollars per year, even in this low-price environment. So, $50,000 isn’t going to kill them. Indeed, those operators stand to recoup some or all of their costs by selling the natural gas that otherwise would have wafted into the air. As for the hundreds of low-production “stripper wells” out there, they can be exempted from provisions of the rule if the operator can demonstrate that the rules could put them out of business. It’s highly unlikely that any wells will be shut down as a result of these regulations, alone. And, as industry spokespeople like to point out, many operators have already replaced valves, improved liquids unloading processes, or otherwise modernized their equipment, so they are already in compliance and the new regulations should not impose any additional costs. Take ConocoPhillips. Its San Juan Basin facilities collectively make up one of the biggest emitters of methane in the nation. But between 2013 and 2014, it cut emissions from those facilities in half — mostly by implementing the same measures required by the new rules — and then continued to cut into 2015. It didn't damage the bottom line: The company reaped a $6.9 billion profit in 2014. Colorado passed methane emissions rules for the oil and gas industry in 2014. Though they don’t apply to flaring, they are otherwise similar to the Bureau of Land Management rules. That state has not seen mass well shut-ins as a result, and in fact, many oil and gas producers supported the regulations. That’s in part because enlightened operators see in these and other regulations an opportunity for economic development. Whatever a company spends on compliance is not vanishing into the ether. It’s going towards different jobs, equipment and the local economy. Many operators hire local leak detection and repair services, for example, thus supporting small business. Rather than killing a gold-egg-laying goose, the rules are propagating new ones. Even if the cost of compliance does shut down some wells, the oil and gas is not lost forever. It’s being stored up underground for later extraction, when supplies are more limited, prices are higher, and more money can be made off of it. In mining country, the tailings wars raged for at least fifty years. State legislators passed laws purportedly protecting fish from tailings, but they were never enforced. Judges often ruled in favor of the farmers, and sometimes even awarded them damages. But they also bought into the miners’ economic arguments, and time after time refused to issue injunctions against dumping or to require the miners to build simple tailings-impoundment systems. That’s in spite of the fact that such systems, amounting to a wall made of sand or logs, cost a tiny fraction of what the mines made each day. Had they kept the tailings around, they could have reprocessed them later with better technology and recovered valuable metals. They dumped them into the rivers instead. The cost of this inaction was high: Fields were damaged, crops stunted, down-streamers were forced to drink nasty water, hydroelectric turbines and domestic water intakes were mucked up, and miles and miles of streams were rendered uninhabitable to fish. And the return? The mine, mill, and smelter owners who, more often than not, lived in Maine, Kansas City or New Jersey, raked in just a little bit more profit to add to their empires.